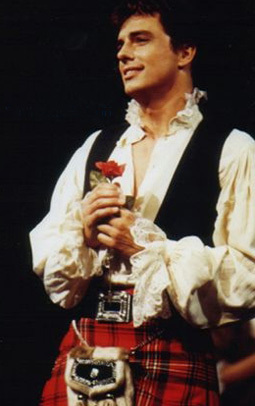 In 1996 John traveled to Denmark to portray the poet Robert Burns in David Gest's production of Red Red Rose. With music and lyrics by Paul Alan Johnson and book by George Rosie, the musical took its title from Burns' famous 1794 song, "My love is like a red red rose" which is often published as a poem. The show follows Burns' colourful love-life, which in his day did not endear him to the elders of the local church. He fathered a child with his mother's maid, Elizabeth Paton, before having twins with Jean Armour. They were later married. Jean bore him nine children but sadly only three survived infancy. Red Red Rose won third place in a competition for new musicals which attracted a large number of entries. Excerpts from the final three musicals were performed on the night of the awards in Denmark. John recorded the title song for his CD Reflections from Broadway. It also features on the CD, Musical of the Year 1996. This album also contains other songs from the musical and selections from the other two winning musicals.